Good question. They are stable, long-shelf life foods, pre-cooked and, yep, ready to eat. A real, full-sized M.R.E. contains several components--including an entrée, side dish, dessert, cracker or bread, spread, drink powder, coffee, utensils, and accessories (including the much-sought after mini-hot sauce bottles). 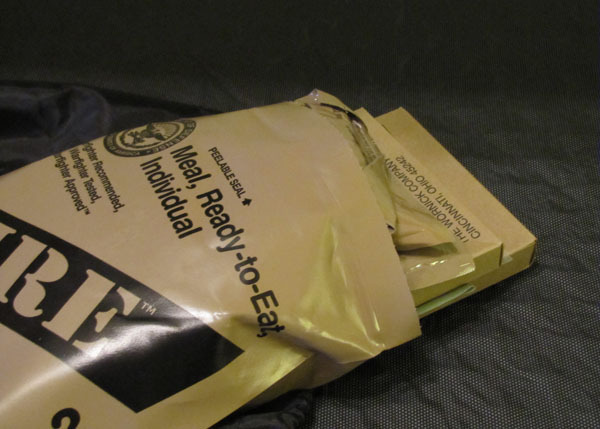 MREs are all packaged with a four digit date code--the first number being the year they were made, and then the following three the day in that year. So 7235 would be the 235th day of 2007. When shopping for MREs, always look for this date, as it will tell you how old they really are. Many sellers will mention the "inspection date" instead, which is usually 3 years after the actual package date. So, someone selling MREs with an 2006 inspection date is selling 5-year old MREs--probably not a wise purchase, as they've probably exceeded their useful life. MRE cheese and peanut butter spreads are very good, and make good snacks along with crackers. Keep a few stashed in your desk/car, along with a package of Ritz crackers, for a good snack.